The U.S. Citizenship and Immigration Services (USCIS) announced that it is adjusting the premium processing fee for Form I-129, Petition for a Nonimmigrant Worker and Form I-140, Immigrant Petition for Alien Workers beginning on October 1. The premium processing fee will increase to $1,410, a 14.92 percent increase (after rounding) from the current fee of $1,225. This increase, which is done in accordance with the Immigration and Nationality Act (INA), represents the percentage change in inflation since the fee was last increased in 2010 based on the Consumer Price Index for all Urban Consumers. The new rule was published in the August 31, 2018, Federal Register. The INA allows certain employment-based immigration benefit applicants and petitioners to request, for a fee, premium processing. The law authorizes the Secretary of Homeland Security (Secretary) to charge and collect a premium processing fee for employment-based petitions and applications. The fee must be used to provide certain premium-processing services to business customers, and to make infrastructure improvements in the adjudications and customer service processes. By statute, the fee, initially set at $1,000, must be paid in addition to any normal petition/application fee that may be applicable. Premium processing is an optional service allowing certain petitioners to request 15-day processing of certain employment-based immigration benefit requests if they pay an extra amount. This extra fee will generally fast-track the request. The premium processing fee is paid in addition to the base filing fee and any other applicable fees, which cannot be waived. Given the current employment environment, many employers request premium processing for some visa types, such as H-1Bs, particularly when the cap is involved. Therefore, any employer who is planning on taking advantage of premium processing will need to be aware of the increase. 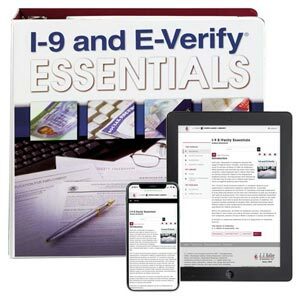 J. J. Keller's I-9 and E-Verify Essentials Manual contains up-to-date info on new Form I-9 requirements and the entire employment authorization process.